On the title page: The Presidential Library presents the 70th anniversary of the end of the Second World War From war to peace. Duration: 8 min. 29 s.
The film tells about the exhibition devoted to the final stage of the Second World War and how the bipolar world was formed in the first post-war decade. The exhibition was held in the Presidential Library from September 1 to November 9, 2015. The exposition presents rare archival, book and photographic materials . I. Evseeva, Marina Igorevna. II. Yarosh, Vladimir Mikhailovich. III. Raytsev, Nikolai Yakovlevich. IV. Khudyakova, Alexandra Sergeevna. V. Zhuzhnev, Sergey Anatolievich. VI. "From war to peace ... To the 70th anniversary of the end of the Second World War," exhibition (St. Petersburg, 2015). VII. Presidential Library. B. N. Yeltsin (St. Petersburg) .1. Presidential Library (St. Petersburg, city) - Activities - 2015 - Multimedia publications. 2. "From war to peace ... To the 70th anniversary of the end of the Second World War", exhibition (St. Petersburg, city, 2015) - Multimedia publications. 3. The people (the collection). 4. Power (collection). 5. Soviet-Japanese War of 1945 (collection). 6. Russia and the countries of the world (collection). 7. Soviet-Japanese War - 1945 - Multimedia publications. 8. 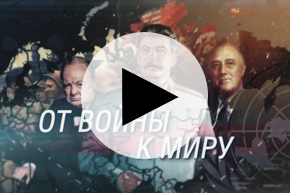 "Cold War" - Multimedia publications. 9. International relations - 1945 - 1955 - Multimedia publications. 10. Video tours.